The story begins as Mr. and Mrs. Mallard fly over various potential locations to start a family. Each time Mr. Mallard selects a location, Mrs. Mallard finds something wrong with it. Tired from their search, the mallards land at the Public Garden Lagoon to spend the night. In the morning, a swan boat passes by the mallards. The mallards mistake the swan boat for a real bird and have a second breakfast of peanuts thrown from the people on the boat. Mrs. Mallard suggests that they build their nest in the Public Garden. However, just as she says this, she is nearly run down by a passing bicyclist. The mallards continue their search, flying over Boston landmarks such as Beacon Hill, the Massachusetts State House, and Louisburg Square. The mallards finally decide on an island in the Charles River. From this island, the mallards visit a policeman named Michael on the shore, who feeds them peanuts every day. Shortly thereafter, the mallards molt, and Mrs. Mallard hatches eight ducklings named Jack, Kack, Lack, Mack, Nack, Ouack, Pack, and Quack. After the ducklings are born, Mr. Mallard decides to take a trip up the river to see what the rest of it is like. Mr. and Mrs. Mallard agree to meet at the Public Garden in one week. In the meantime, Mrs. Mallard teaches the eight ducklings all they need to know about being ducks. Design a nest for the ducks at the Boston Garden that would keep the ducks safe. Design a product that will keep the eggs warm while Mrs. Mallard visits with Michael the policeman. 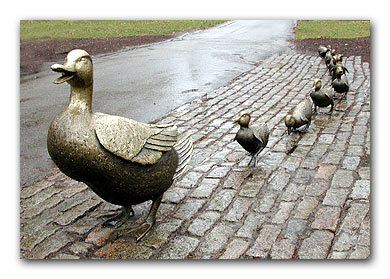 Design a way to keep the ducks together and safe on their long walk to the Boston Garden. Design a play area for the ducks. Design a way to keep the duck sculptures that are currently at the Boston Garden safe from the public (some people like to steal them! ).